The latest round of circulation figures show newspapers have once again seen double digit declines in print across major mastheads, with publishers seeking to emphasise signs of positive growth in their digital audiences. Among the biggest declines in the three months ending in September were weekday editions of News Corp’s Sydney paper The Daily Telegraph, which fell below 300,000 for the first time. The Herald Sun fell through the 400,000 level for both its Monday to Friday and Saturday editions. At Fairfax Media, both The Sydney Morning Herald and The Age posted more than 15 per cent declines in circulation, with 136,623 and 133,981 editions sold Monday to Friday respectively. The important profit centres of the Sunday and weekend editions again saw large declines with News’ Sunday Telegraph sales down from 600,000 last year to 516,584 this year, a fall of 13.94 per cent. Rival the Sun-Herald posted a fall of 15.22 per cent compared to the same period a year ago, with a reported circulation of 273,790 editions. However, this was only a slight fall from last quarter’s number of 276,172, suggesting the newspaper is finally beginning to stabilise after a period of ending discounted copies and increasing cover prices. National newspapers suffered moderately smaller declines in circulation with The Australian down 7.92 per cent for weekdays, and 9.81 per cent for the weekend edition. The Australian has a circulation of 250,186 on weekends and 116,854 on weekdays. Business newspaper The Australian Financial Review was down 6.07 per cent on weekdays to 64,270 and 9.76 per cent on weekends, with 62,278 copies shifted. But both major publishers were eager to emphasise signs of growth in their digital subscriptions, although the numbers do not clearly split out digital only subscriptions versus those that came bundled with print. Allen Williams, managing director Australian publishing media, Fairfax Media, said: “This is the first release to include sales data from our successful launch of digital subscriptions for The Sydney Morning Herald and The Age websites, m-sites and tablet apps on July 2, 2013. “The results have surpassed our expectations and show that our strategy is working – paid digital sales have grown by double to triple digit percentages for both the SMH and The Age.” The audit figures show Fairfax’s The Age has 97,788 digital subscribers, The SMH has 98,177 digital subscribers on weekdays. These figures include people who have bundled digital and print subscriptions as well as digital-only access. No details were given on price, although many educational subscribers previously receiving a highly discounted print edition now receive the same deal for digital. News Corp CEO Julian Clarke claimed: “The data shows that people are consuming both print and digital versions of our products to satisfy their increasing appetite for news. We are delighted that The Australian continues to grow its weekday paid sales,” he said. The Australian has 55,991 digital subscribers while the Herald Sun has 37,654 digital subscribers. No digital numbers for the AFR? Why is The Australian showing the same subs creative in banners as last year? Surely they know about advertising? why lead this story with the Newscorp declines, which aren’t quite as bad (percentage wise) as the Fairfax ones? Time altered some comment appears in line. I led with the News Corp declines mainly because both the Telegraph and Herald Sun had passed significant milestones with circulations falling below 300,000 and 400,000 respectively. As I said in a previous article when inner city types were rabbiting on about tthe character of Sydney being reflected in its newspapers, The Daily Telegraph is rapidly losing its core audience in the suburbs. Whittaker has got to go. What The Aus ‘knows’ about digital could fill thimbles. Hang-on, but the readership numbers for print are increasing? I don’t understand. JD , the pass-on rate is increasing as people are less keen to buy their own copy but are still willing to read it – more shared copies. JG – Really! I think this is a good excuse for newspapers to talk up the real figures. @JD: the readership numbers always shift around because they are a sample and sampling is getting harder. Best to treat them as a guess. The paid numbers are falling because the cost of giving away papers is more than the benefit these days for the simple reason that advertising has moved away from print. What is not clear from all of this is what the measures are really for these days. Certainly not to sell ads. My theory is that the publishers are desperately trying to talk up total audience because it’s the only story they have for investors. Sadly, the dollars are telling another yarn. If you really want to put a publisher on the spot, ask for audited de-duped audiences for print and separately for digital. There is a lot of smoke and mirrors in these aggregates. JD and JG – that might have something to do with the number of newspapers given away as well. Love reading Mumbrella. It has become the only reliable source of information about what’s really happening in the media. Regarding newspaper circs, it’s not surprising the metros are in decline. This is what happens when companies encourage the most skilled editors and journalists to leave, slash and burn pagination, dumb down news coverage and run biased agendas. 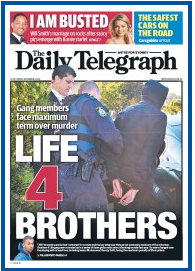 The Daily Telegraph at least still has some news pages. However it constantly lets itself down by bias. There’s no doubt its ridiculous election coverage cost it readers, particularly in Western Sydney, which did not embrace as expected its campaign to “kick this mob out”. The swings against Labor in western Sydney were relatively modest. More recently, its coverage of the disastrous launch of Channel 10’s Wake Up begs examination. The number of puff pieces leading up to the launch of this show was humiliating, and when the show ran into trouble, oh, surprise, surprise, the paper ran excuse-making snippets that were pro-Channel 10, owned by, oh that’s right, Lachlan Murdoch!! People buy newspapers for news, not to be spoon-fed distorted PR for businesses or political parties affiliated with those newspapers. If you can’t get independent journalism, why bother buying?